Eddie Vedder welcomes fans of Pearl Jam and of his solo work for Into The Wild to relax, sit around the fire, and enjoy the simple tunes of Ukulele Songs. 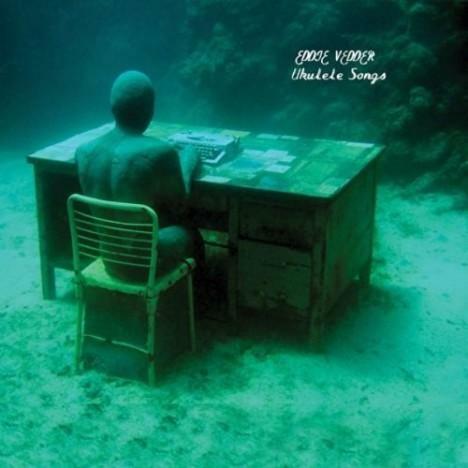 Vedder's second solo album, Ukulele Songs pulls no punches and hosts no gimmicks in it's name. It is openly and honestly an album of songs on ukulele. And as counter-counter-culture or anti-traditional-Pearl Jam that may seem, Vedder seems to mesh the instruments of his voice and impeccably strummed ukulele beautifully. What listeners will likely notice first about Ukulele Songs is how sonically simple and stripped down the album feels. To be fair, it is just Vedder and a ukulele for the majority of the album. The mixdown of the album, despite how simple, paints a rich picture of the tone Vedder wants to set for the listening experience. Vedder's voice is panned far right enough to add depth to the aural spectrum, making the listener feel like they are in a small club enjoying an intimate concert among treasured friends. The album opens on a Pearl Jam cover, the only of the record, "Can't Keep." Fans of Pearl Jam and Vedder will have likely heard an acoustic guitar or uke version of "Can't Keep" already, but those who are only familiar with the version found on Riot Act should be pleasantly surprised at the familiar-but-different warmth created by Vedder's unique vocals over the ukulele. For skeptics who believe they would get bored with an album stacked with nothing more than songs on a uke, it should be noted that the almost-thirty-five-minute album is broken up into 15 songs with only two breaking the three minute mark. While the tone of the uke will always seem "samey," Vedder has ensured that he moves on to another song before anything ever gets old. And just when you realize that the album is lacking in anything apart from rhythm and vocal, Vedder segues the socially aware "Satellite" into the first single from the album, "Longing To Belong," throwing a cello into the mix. The collaboration is a welcome change and aptly placed. Don't miss the cover of the Ozzie Nelson classic "Dream A Little Dream [of Me]" at the end of the album, or the pleading but upbeat "You're True." Vedder's duets with Glen Hansard and Cat Power are nothing short of gorgeous and the range of melodies and tunes Vedder has cranked out of a miniature instrument with four strings is anything but small. If any criticism can be made of the album it should be that many of the tracks are so short that the listener is left wanting, grasping at the few fanning flames of music from Vedder's fragile, burning heart on this very sentimental and touching collection. Wife just got me a uke for christmas, giuatr has been broken for months.. so happy to have an instrument back.. love this song to death .. not too difficult but still a challenge on the down down up up down riff.. thanks alot though!